Avendus Capital advises Grama Vidiyal Microfinance Ltd on raising long-term senior and subordinated facilities from WorldBusiness Capital, Inc.
Grama Vidiyal Microfinance Ltd (“GV”), a leading microfinance company based in Tamil Nadu has received long-term senior and subordinated debt facilities from WorldBusiness Capital, Inc. (“WBC”). With over two decades of experience in lending to women borrowers, GV caters to the specialized financial needs of its customers with several credit and credit plus products within the ambit of microfinance loans. 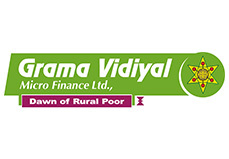 GV, registered as a Non-banking Finance Company - Micro Finance Institution (NBFC-MFI), is one of the largest microfinance institutions in the country with Gross Loan Portfolio in excess of INR 5.5 billion. The company operates in the states of Tamil Nadu, Maharashtra, Madhya Pradesh and Pondicherry, with around 1 million customers. With its varied products, GVMFL not only aims at achieving the economic sustainability of its women members, but also facilitates holistic empowerment of women and their families in social and cultural fronts. WBC (worldbusinesscapital.com) is a commercial finance company that offers flexible term loans helping small and midsize businesses compete in the global marketplace. Founded in 2003, WBC is a direct lender staffed by multilingual professionals with many years of experience in cross-border trade and project finance. The WBC team has a proven track record of successfully-closed loans around the world. Avendus Capital is a leading financial services firm which provides customized solutions in the areas of financial advisory, equity capital markets, alternative asset management and wealth management. The firm relies on its extensive track record, in-depth domain understanding and knowledge of the economic and regulatory environment, to offer research based solutions to its clients that include institutional investors, corporations and high net worth individuals/families. In recent years, Avendus Capital has consistently been ranked among the leading corporate finance advisors in India and has emerged as the advisor of choice for cross-border M&A deals, having closed around 40 cross-border transactions in the past 5 years. Avendus PE Investment Advisors manages funds raised from its investors by investing in public markets, while Avendus Wealth Management caters to investment advisory and portfolio management needs of Family offices and Ultra High Networth Individuals / families, spanning all asset classes. Headquartered in Mumbai, the firm has offices in New Delhi and Bangalore.